Check, and then recheck: Before hitting the open road with your boat in tow, or even leaving your driveway, always perform a full safety inspection of your vehicle and towing apparatus. Then check everything again. Light it up: Plug in the trailer lights to your tow vehicle and run a full check to verify that they are in working order. Check running lights, right and left turn signals, brake lights, and hazards on the trailer and tow vehicle, as well as the headlights of the tow vehicle. Trailer lights should be used at all times, even during daylight hours. Distribute the weight: When loading up your boat before departure, make sure that the weight is evenly distributed and that all items are secure. 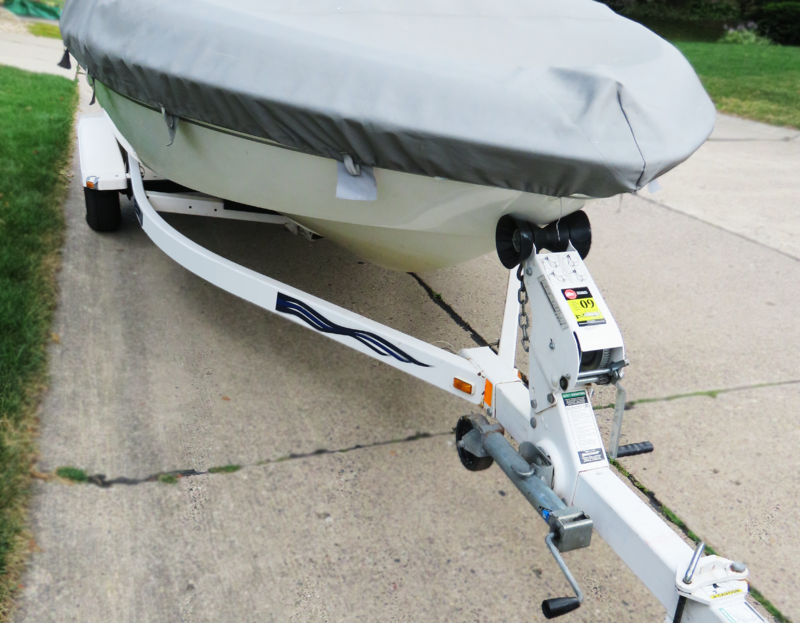 It is important that the boat stay balanced while on the trailer to avoid shifting en-route. Cross your chains: The safety chains that extend from your trailer and attach to your tow vehicle should always be crossed over one another under the trailer tongue. The chains should be slack enough to compensate for turns, but taut enough to avoid trailing on the ground. If for some reason your hitch fails, the crossed chains will catch and support the loose trailer tongue so that it won’t dig into the road. Give yourself space: When merging into traffic or attempting to pass another vehicle on the road, keep in mind that it will take you a longer time to accelerate. A vehicle loaded down with a trailer, a boat, coolers, fuel, and passengers is simply not going to get up to passing speed as quickly as you are used to, so exercise patience while on the road. Brake early: The added weight and length of a towed boat to your vehicle means that the amount of time needed to come to a complete stop is greatly increased, so leave ample space between yourself and other vehicles on the road. Not only can slamming on your brakes with a boat in tow cause you to rear-end a vehicle in front of you, but it can also cause the trailer to jackknife (when a vehicle towing a trailer skids and its trailer pushing from behind spins it around until it collides with its own trailer/vehicle and its trailer go into a skid and the trailer swings out and stops to form a 90-degree angle with the vehicle). Be sure to slow down early and gradually pump the brakes to bring your vehicle to a safe and controlled stop. Turn wide: A vehicle with a boat in tow requires a much wider turn radius. When approaching a turn, stay in the outermost lane and swing as wide as traffic will allow. Practice makes perfect: New to boat towing? Trailer your boat and head to a large open parking lot to practice accelerating, coming to a complete stop, making turns, and backing up. The more you practice handling your vehicle with your boat in tow, the more comfortable you will feel on the open road. Following these tips can help to ensure a safe boat towing experience so that you can enjoy time on the water with family and friends. Now don’t forget your sunscreen!